Read about how to find regions of poor mesh quality using CONSELF. DEVELOP3D reports that Autodesk’s Project Memento is now a commercial product called ReMake for converting images into 3D meshes. Rhino Rotorblade, a plugin for generating airfoils, wings, and rotors, is now available as v2.00. Gratuitous grid picture. 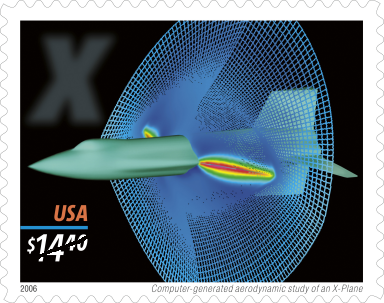 Remember when CFD and a Gridgen grid were on a USPS express mail stamp? CD-adapco also announced the first North American Vehicle CFD Conference, to be held in Detroit on 02 June. EnSight introduced a new Resources area on their website with assets, downloads, videos, and tutorials. Technavio projects a 12% annual growth rate of the global simulation and analysis software market from 2016-2020, driven primarily by its ability to reduce time to market. Alert reader J.P. shared the overtly faceted and meshed graphic design of Dallas Theater Three’s production of Tigers Be Still, a comedy. Whether comedy and meshing are related is unknown. I have contacted the theater company for insight. Bonus: How chilling with Brian Eno Changed the Way I Study Physics. Excerpted from the Jazz of Physics, it’s another example of how the arts and sciences are more alike than different. Eno’s music has always been of part of my listening repertoire. Example: Eno and Budd’s 1980 masterpiece, Ambient 2. Today’s post was more complex to write than normal because Chrome decided to re-organize my bookmarks for me. Thanks, Google! Granted, I probably have a few more bookmarks than the typical web browser, but still. This entry was posted in Events, News, Software and tagged Autodesk, CD-adapco, ConSelf, EnSight, meshing, Project Memento, ReMake, Rhino. Bookmark the permalink. I didn’t find the snake aero reproducibility paper very compelling. It seems like the reproducibility folks are ignoring the VV&UQ folks. You know, you’re the second person to mention UQ today. That must be some kind of trend. Certainly there’s crossover between reproducibility and UQ. Because UQ is relatively new to computational sciences, I’m betting that people have varying expectations about their ability to reproduce a computation to a certain level of accuracy and whether that level falls into UQ or whether it’s indicative of something fundamentally lacking.